I don't know if you are like me, but I feel bored when after my shower I need to dry the mirror many times to see my face for shaving (or make-up for girls and ladies). How-to solve this delicate problem ? 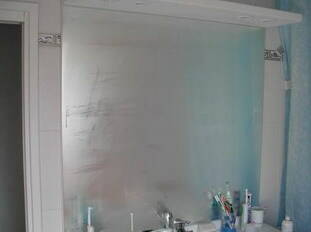 First of all, see what's happen: taking a shower make the bathroom full of hot mist. When this mist find a colder surface (like a mirror for example), it distill on it. The solution is so to protect the mirror from mist. By rubbing a piece of dry soap on the mirror (when it is dry too), so that the mist is drained along the surface. But you need to make it again regularly. By making mirror as hot as the mist, or maybe more, so that the mist could not distill on it. Typically a hot bathroom is about 25°C or 77°F, so having a mirror at about 30°C or 86°F will be ok. It's the second solution that I have choose. 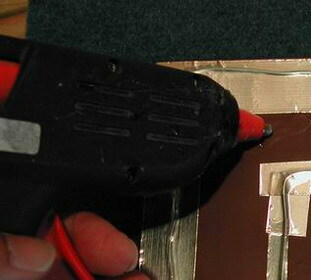 The idea is to make a mirror warmed up, at back, by an electrical resistance who maintain it at about 30°C or 86°F. 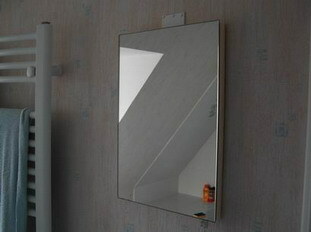 A mirror: yes of course, take one with its back free (no plastic, wood or anything else on it). The shape doesn't matter. Resistive wire: not easy to find, you can try electronic components dealers, hardware, paint stores or plastic arts shops. This wire is sometimes called "constantan". 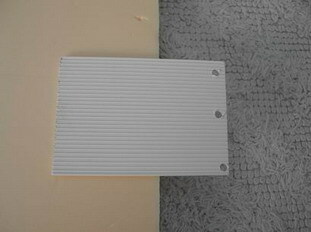 Aluminium tape for fireplace or chimney: it's a kind of large sticking tape, heat resistant. You can find it in hardware store. 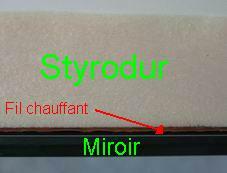 A piece of styrofoam: of about 1 cm or 0.5 inch thick, to protect from heat the wall where your mirror will be. A power source: Anything that could give you about 15 volts, no matter AC or DC. 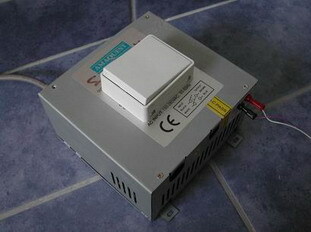 I use an old PC power supply, and it's 12 volts output, throught a switch. For PC power supply recycling, see this site (in French only). 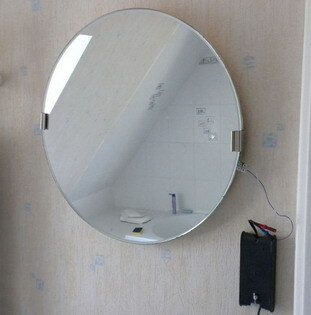 Miscellanous : Electric wire, glue, electric clip and a hook to hang the mirror when it will be over. Once Method is choosed, you can do the mirror as you like. Here is my personal way. Well clean the back of the mirror to get perfect tape sticking. To well work, put the mirror on an old wall-to-wall carpet or a towel. 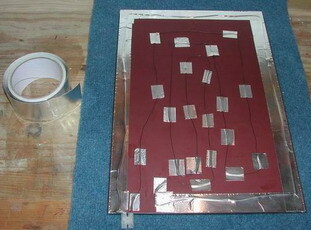 Make a path with resistive wire on the back of the mirror, as regularly as possible. The wire should exceed a bit from the mirror, at beginning and end, to be in the electric clip. A bit like on this drawing. 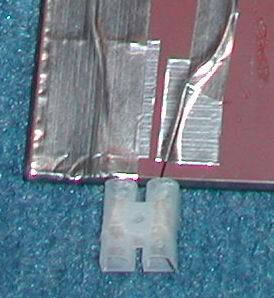 Stick wire using pieces of aluminium tape. You sould not get wire crossover. Once all the wire is sticked, stick the stryrofoam on the back. The best way is to stick a piece of styrofoam bigger than the mirror, and then egalize all around the mirror using a cutter or better a filicutter. Put the end and start of wire in the electric clip. This could be made bofore or after sticking styrofoam. Mirror itself is over, you just need to stick a hook on top to hang it later (I use and old piece of plastic). Plug then electric clip to power source to switch on and start to heat. The mist free mirror in action ! Both side by side (for the photo): note the mist on the big one and no mist on the small one. Pc power supply is replaced by a DELL laptop power supply which produce about 20 volts, which is much more efficient than PC power supply. I have just added a swith before main power. A calcul should certainly be made between resitance of wire and electric power. 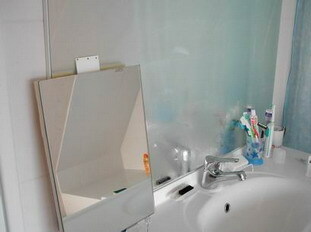 If you have a big mirror in your bathroom why don't make it a mist free AND heating mirror ? 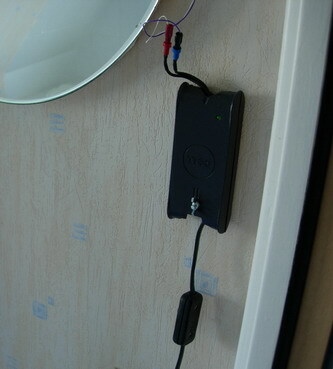 The main difficulty will probably be to put a very long resistive wire on mirror already in place. 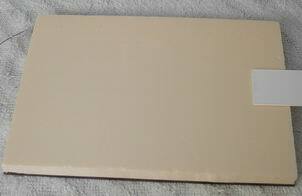 It's too bad that we have no news of this famous heating paint.